Michael McRee of Chowchilla is honored as 2017 CASI Farmer Innovator. Chowchilla dairy farmer Michael McRee has been named the 2017 Conservation Agriculture Farmer Innovator by the Conservation Agriculture Systems Innovation (CASI) Center for his innovation and leadership in the development and use of conservation agriculture systems on his farm. “Mike McRee has been extremely willing to share his experiences with others and has graciously hosted numerous public field days at his dairy farm over the years,” said Jeffrey Mitchell, UC Cooperative Extension cropping systems specialist and CASI founder. The dairy producer, who milks about 2,000 cows at his farm west of Chowchilla, double crops his own dairy forage along with tomatoes and alfalfa crops on about 850 acres. After his pioneering efforts with strip-till – some of the very earliest in the entire San Joaquin Valley – McRee soon found that the conservation agriculture practice saved him time and money as he had anticipated, and yielded other important benefits for his farm as well. McRee noticed improved water-holding capacity of his soil since working with strip-tillage, as well as increased consistency in the soil's ability to absorb water, mellower soil overall, and more consistent crop stands and yields overall. Improved soil tilth, increased soil organic matter and earthworms give him consistent yields year to year without extreme highs or lows. McRee's quest to improve the performance of his silage production systems began back in 2007. He readily admits that he faced challenges early on. He tried no-till wheat, but was limited in this effort by hard, compacted soils. Having the right equipment is a key to the whole endeavor, McRee points out. He has worked with local NRCS partners and the EQIP program, which assists growers with implementation of practices to improve our soil, water and air resources. Following a great deal of consultation with other growers and experimentation, he developed a very successful strip-tillage system for his silage corps. The change was spurred initially by his interest in reducing the number of times he had to drive a tractor through his fields to save fuel and labor. He now does fall primary tillage using a Wilcox 7-shank subsoil ripper with a crumbler. Vertical tillage has replaced disc plowing to achieve a smooth seedbed without turning the soil over. After winter forage is harvested, preparation for corn silage planting begins. McRee explains that he rips the soil down 13 to 14 inches and uses coulters to prepare the seedbed. After pre-irrigation, he uses the Dawn Pluribus strip-till row unit, a tool that preps an eight-inch band of soil for planting. Using GPS, he can run his tractor 6 to 7 mph for this pass. “With three passes, I can do everything,” McRee said. 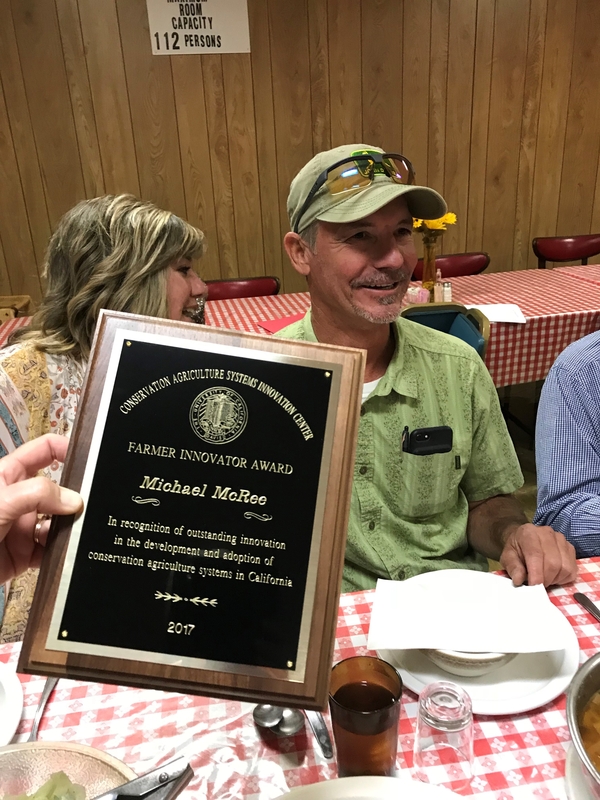 McRee received the award Oct. 13 at the annual meeting of the San Joaquin Valley Resource Conservation Districts held at the Wool Growers' Restaurant in Los Banos. In 2005, the University of California, NRCS and the Conservation Agriculture Systems Innovation (CASI) Center established the Conservation Agriculture Farmer Innovator Award as a means for providing greater visibility to conservation agriculture pioneers in California. The criteria for this award are demonstrated innovation and leadership in the development, refinement and use of conservation agriculture systems within the California crop production environment. For more information about conservation agriculture systems, visit http://casi.ucanr.edu.